Six Channels/DSP/EQ and 3-way Input Summing Amplifier? Audiotec-Fischer’s new six-channel amplifier with built-in DSP/EQ and high wattage high-level input with six-channel of summing capability is simply a work of art – try to say that fast. The milled aluminum with black exterior accents is easy on the eyes but what about the inside? I have not seen damping factors (> 1000) in years since the old Rockford Fosgate DSM amplifiers of the early 90s. This is unheard of in a class “D” amplifier! With the chassis only being 10 x 7 x 2 inches in size, this next generation of an amplifier will fit in any vehicle today. And with a minimum of 120 x 6 watts in this heatsink, this piece becomes a true solution piece for upgrading or replacing those troublesome factory amplified systems that we all have a love/hate relationship with. You can get the high-level signal or speaker inputs AFTER the factory amplifier! The ability to do direct Bluetooth streaming! This amplifier has all the important features that are needed for today’s complex systems. 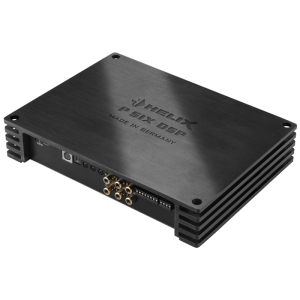 OEM integration is being the fastest growing segment of 12-volt audio today, and this piece fits the application perfectly. This amp is worth a visit to your local store to audition this amplifier.